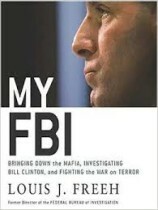 The FBI that Freeh took over in the summer of 1993 was still reeling from the bloody standoff at Ruby Ridge and the conflagration at the Branch Davidian compound in Waco, Texas. Unpopular, underfunded, and understaffed, the Bureau was also creeping along in the technological Dark Ages. For eight years—the second longest tenure of any director since J. Edgar Hoover—Freeh would fight tooth and nail to turn the FBI around. In My FBI, we follow Freeh through his five-year battle against Clinton, National Security Adviser Sandy Berger, and others to win indictments for the Khobar bombings in 2001, which stated that Iranian government officials played a role in the attack.